Happy Earth Day everyone! I briefly contemplated a doom and gloom post about the state of the global climate and lack of regulation. But let’s focus on what does work, albeit at a much smaller scale, instead of what doesn’t work. Team Auffhammer has invested a lot of money in energy efficiency measures in our home. We have new windows ($$$$), a new roof ($$$), German shutters ($$), more efficient appliances ($$) and LED lighting ($) throughout the house. I have been monitoring our energy consumption after each of these investments and could not detect a structural break in our consumption of electricity or natural gas. Last September I was at the Apple store and saw they sold a “smart” thermostat called the “NEST”. I checked with a genius (they wear blue shirts) and she said that people liked them and they were easy to install and looked cool. I was sold. I went home. Ripped out our old thermostat and put in the new one. Shiny, cool looking and simple. I then did not program it and let it learn our patterns. The thermostat guesses when you are away (with a minimal number of type I and type II errors). Plus, you can control the thermostat from your phone, tablet or the web. So if you leave for vacation and forget to turn it off, you can do so from the beaches of Maui. I did not think much was going to happen. Boy was I wrong. The picture below displays our electricity consumption for the past 12 months in green and the previous 12 months in red. The blue dashed line displays the installation date of our thermostat. This is a highly unscientific difference in difference by picture estimate. By using the previous year’s consumption as my counterfactual this picture suggests that we have consumed 1055 fewer kWhs since least September, which is an average savings of 150 kWhs per month or a 22% decrease in consumption. Wow! How much did my new fancy thermostat save me? We actually use(d) a fair number of kWhs which cost $0.29, due to the increasing block rate pricing structure (the more you use the higher the price of the next block of kWh consumed). After spending way too much time with my bills, I figured out that I saved almost $210 since September. If my forecast is right I will have made my money back by the end of the next billing cycle. Now, I would be an irresponsible social scientist by simply prescribing these fancy $249 thermostats for everyone. The NEST changed our behavior. It brought energy conservation to our attention and each member of the family interacts with this shiny gadget a few times a day. We frequently question whether we really need to turn on the AC or heat. Maybe more importantly this thing is fun to use and looks cool. Now go outside and do something nice for Mother Earth. And again tomorrow. And the next day. And the day after……..
And no, this blog post was not sponsored by Nest. Cross-posted from Energy Economics Exchange (tag line: Research that Informs Business and Social Policy), a blog of the Energy Institute at Haas. I installed two NEST in my home almost a year ago. The Nest has lowered my energy usage when compared to the previous 12 months. I’d love to have a copy of your graph spread sheet so that I could plot my data in the same manner for comparison. I love the Nest, I have no doubt it saves people money. But I wish folks would correlate their energy use with heating degree days and cooling degree days to understand how much they are saving energy because of the improved thermostat OR because this year is some percentage cooler or warmer than the last. So you mentioned natural gas, so I assume that is the fuel used to heat your home. So you also need to compare your gas usage to get a complete look at things. This is one part that makes measuring the true effectiveness of the Nest difficult, weather and behavior being the biggest. Don’t get me wrong, I have two of them in two different houses, and love them. Greg — I was going to post the exact same thing! I’d be curious to see that clarified. Your graph is confusing. Your installation line intersects both lines and your comments seem to indicate that this is data going back 24 months. I don’t see how this works. 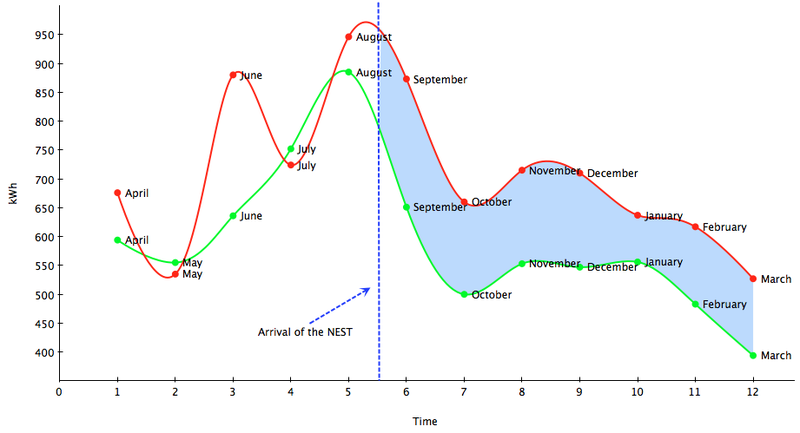 The Blue line shows when the nest was installed (in august 2012), and then the shaded blue area is the difference year to year of the kWh used. Was your thermostat manual or on a timer before the Nest?